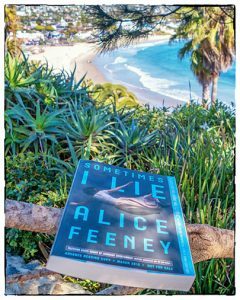 Twisty, dark and claustrophobic, Sometimes I Lie by Alice Feeney is yet another sensational debut in the thriller genre. You might think you’re done with that unreliable narrator trope in suspense novels, but trust me when I say you’re not. Sometimes I Lie takes deceptive plots to another level, the bunch of twists in here are completely jaw-dropping and while you’re busy reeling with their after shocks, the ending will leave you appalled all over again. This is exactly how the book starts, so I was trying to second guess everything since the very beginning, but I needn’t have bothered as I wasn’t able to foresee a single twist. The narrative is compelling, fast paced and totally addicting. There are three sides to the narration, the events taking place after the coma, what happened a week before and some diary entires from the early nineties which is more than two decades in the past. I was chilled to the core reading about Amber’s feelings and experiences while in a coma. Just imagining lying anchored to the hospital bed, being able to hear and feel everything but at the same time being incapable of moving a finger or even the eyelids was giving me major claustrophobic vibes. Other than these chills, the plot has abundant interpersonal drama, manipulations and craftiness essentially all of the regular spices within a psychological thriller. I believe the author truly delivers with the whole package. I tread carefully over a carpet of lies, trying not to disturb them. So, in conclusion this was an impressive, edgy and engaging read with shocking plot twists, flawed characters and an absolutely astounding wrap-up. If you enjoy psychological thrillers, this one shouldn’t be missed. Oh and I am not sure if there is going to be a sequel for this, because if yes, then I am surely going to read that at the earliest. Disclaimer: Although my copy is a physical ARC, it was NOT sent to me by the publishers. I bought this copy from my local Friends of the Library bookstore. All opinions are my own.